This is a such an easy salad to toss together, so healthy and fresh and it’s my girls favourite salad. Often if I’m short of time I take short cuts and use store bought dukkah and sesame dressing. I’m including my recipe for dukkah and dressing so if you want to make the whole thing yourself you can. This make 4 ample serves for hungry eaters. Coat the chicken strips in the dukkah and fry until cooked and golden brown. Peel the hard boiled eggs, rinse but don’t dry and coat each egg in the dukkah. Place a handful of greens on each plate. 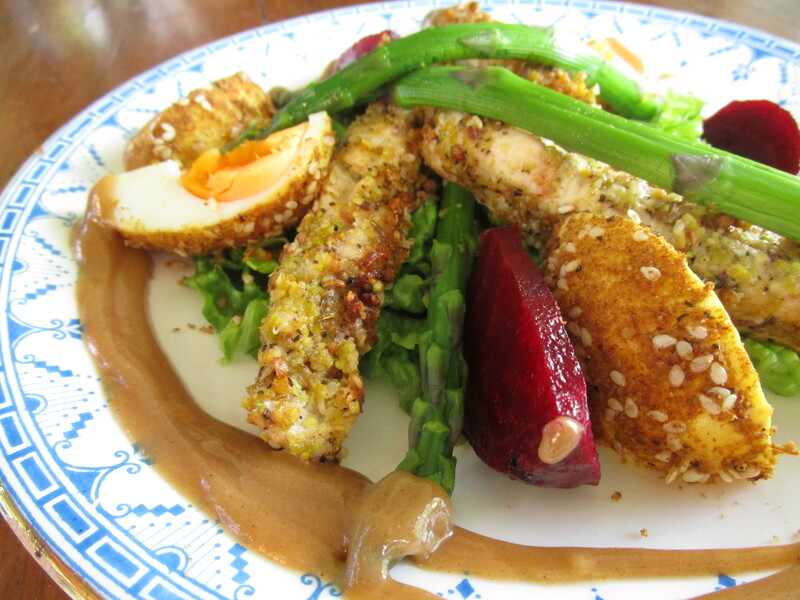 Add the beetroot, asparagus, egg, chicken strips. Sprinkle with the pumpkin and sesame seeds.